Then co-founder and CEO Geoff Vuleta began telling me about the way his executive team manages, and it stopped me short. Here he was, regaling me with all the big brands Fahrenheit called clients -- Coca-Cola (KO, Fortune 500), Samsung, P&G (PG, Fortune 500), and so on -- and all the cool, mind-bending (and of course, top-secret) innovations the company was creating, and I get excited about management strategy. But as anyone who's ever had a boss knows, if there's one place in corporate America that could use some innovating, it's management. Nithya George left an investment-banking position right before bonus time to become an innovation consultant at Fahrenheit 212. Fahrenheit's answer to that is "100-day plans." Every 100 days, everyone gets together, locks the doors, ditches the cell phones, and sits down to a company-wide strategy session. Together, they set the company's goals for the next 100 days. And they go around the table to hear how each staffer -- execs included -- did on his personal deliverables over the last 100 days. They ask each other questions, weigh in with their own perspectives on their colleagues' work, and do lots of ribbing, reflecting, and cheering. And if the fear of being embarrassed in front of rowdy colleagues weren't enough, staffers work directly with their managers to lay out their individual plans for the next 100 days and actually grade themselves on their last 100-day plan -- and at the end of the year, the scores are added up to help determine incentive bonuses and future compensation. It may sound simple, but it has the grand effect of making each person his or her own manager. Everyone's goals are completely clear, evaluations are a collaborative process, and perhaps most importantly, managers are just as accountable as their employees -- and they're accountable to their employees. As a result of all this, there's an openness that's inherent to Fahrenheit's culture, and there's no one that vibe helps more than young employees -- i.e., those of us who have no relationships with senior managers, no sense what our goals ought to be, and generally speaking, no clue. 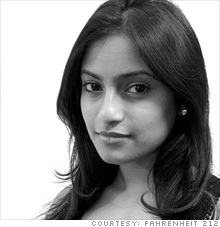 Nithya George, a 26-year-old innovation consultant in commercial strategy at Fahrenheit, was so excited to join Fahrenheit that she left an investment-banking position at UBS right before bonus time. "A lot of people thought it was a silly move," she says. But what may be most compelling about life as a youngster at Fahrenheit is that the company's junior employees don't have to act like normal entry-level hires at all: "There's never a time that I think twice about sending an e-mail," George says. "You can't say a wrong thing here." And that's empowered her to make her mark at Fahrenheit, where she created a series called "Notes from the Bean Counter" to keep her magical counterparts up-to-date on what's happening with the moneyed set. And she's been so swept up in the camaraderie at the company that she's taken over its social life, organizing paintballing trips and games of "Super Bowl Squares" for the staff. George flashes a demure smile. "I've never seen a structure like this," she says. "You sit around the table and say what you did, meet with your manager and discuss what you think you deserve. And you know, sometimes you get bumped up."